Cory Allan Michael Monteith (/mɒnˈtiːθ/; May 11, 1982 – July 13, 2013) was a Canadian actor and musician, known for his role as Finn Hudson on the Fox television series Glee. As an actor based in British Columbia, Monteith had minor roles on television series before being cast on Glee. Following his success in that show, Monteith's film work included the movie Monte Carlo, and a starring role in Sisters & Brothers. Monteith had a troubled adolescence involving substance abuse from age 13; he left school at age 16. After an intervention by family and friends he entered drug rehabilitation at age 19. In a 2011 interview with Parade magazine, he discussed his history of substance abuse as a teen, and in March 2013, he again sought treatment for addiction. On July 13, 2013, he died of a toxic combination of heroin and alcohol in a Vancouver hotel room. Monteith was born in Calgary, Alberta, on May 11, 1982, the younger son of Ann McGregor, an interior decorator, and Joe Monteith, a military man who served in the Princess Patricia's Canadian Light Infantry. He had an older brother named Shaun. Monteith's parents divorced when he was seven years old, and he and his older brother were raised by their mother in Victoria, British Columbia. After the divorce he saw little of his father due to Joe Monteith's military service, and he had social difficulties at school. From age 13, he used alcohol and marijuana and started being truant from school. After attending 16 schools, including alternative programs for troubled teens, Monteith dropped out altogether at age 16. By that time, his drug and alcohol dependency had increased and Monteith turned to petty crimes, such as stealing money from friends and family, to fund his addictions. His mother and a group of friends staged an intervention when he was 19, and he began attending a rehabilitation program. Monteith stated, "I'm lucky on so many counts. I'm lucky to be alive." He eventually received his high school diploma in 2009 from an alternative school he attended in his youth in Victoria. Before breaking into show business, Monteith worked various jobs, including Walmart people greeter, taxicab driver, mechanic, school bus driver, and roofer, and a drummer for a few bands. Monteith began his acting career in Vancouver, British Columbia. He played minor roles in Final Destination 3, Whisper, and Deck the Halls. He had a recurring role in Kyle XY. He also made guest appearances in television serials such as Smallville, Supernatural, Flash Gordon, Stargate Atlantis, and Stargate SG-1. In 2005, he appeared in Killer Bash, about a tormented geek's soul that was taking revenge on his murderer's children by taking over a girl's twin body. The following year, he made a brief appearance in Urban Legend: a Bloody Mary (film), cast as Paul. After Maureen Webb suggested Cory take acting classes; Monteith started acting classes with Anthony Meindl. In 2007, he starred in the MTV series Kaya as Gunnar. In April 2010, Monteith was cast in the romantic comedy movie Monte Carlo. In December 2010, it was announced that Monteith would be starring in and co-producing a new untitled workplace-caper comedy for Fox 2000. In January 2011, Monteith shot the film Sisters & Brothers with Dustin Milligan, which premiered at the Toronto International Film Festival on September 11, 2011. Canadian director Gia Milani's film All The Wrong Reasons stars Monteith as "a big box department store manager whose wife is struggling with post-traumatic stress disorder." Milani suggests he was excited to play his own age, in a "heavy role." He filmed his part on weekdays, flying to Los Angeles on weekends to do promotional work for Glee. In 2011, Monteith filmed a PSA for Straight But Not Narrow, an online PSA organization aimed at changing the minds of young straight people in their attitude and viewpoint towards the LGBT community. In 2012, he hosted the 23rd GLAAD Media Awards in New York City with co-star Naya Rivera. On August 8, 2010, he co-hosted the Teen Choice Awards. Monteith hosted the Gemini Awards in Toronto on November 13, 2010. In 2009, Monteith was cast in the Fox series Glee. He portrayed Finn Hudson. When Glee was being cast, Monteith's agent, Elena Kirschner, submitted a video of him drumming with some pencils and Tupperware containers. Series creator Ryan Murphy took notice of the video, but pointed out that he had to be singing, as auditioning actors for Glee with no theatrical experience were required to prove they could sing and dance as well as act. Monteith submitted a second, musical tape, in which he sang, in his own words, "a cheesy '80s music video-style version" of REO Speedwagon's "Can't Fight This Feeling." He then attended a mass audition in Los Angeles; his vocal skills were considered weak, but he later performed very well with one of Glee's casting directors, who said that his audition captured the most elusive quality of Finn's: his "naive, but not stupid, sweetness." Monteith said of his casting process, "I was like a lot of kids, looking for something to be interested in. Something to be passionate about. All you need is permission. Not only for Glee, but for anything in life." Finn is the star quarterback of his high school football team, and risks alienation from his friends by joining the school's glee club. He is a popular jock at the top of the school's social hierarchy, but when forced to join the glee club, he finds he loves it. His storylines have seen him struggle with his decision to stay in the club, which is at the bottom of the social ladder, while he maintains his popular reputation and the respect of the other jocks. The character must deal with his attraction to both head cheerleader Quinn Fabray (Dianna Agron) and glee club star singer Rachel Berry (Lea Michele), and his storylines increasingly focus on his relationship with them both. Monteith felt that Finn had to "grow up a lot" during his time on the show. The actor said, "Finn started off as the stereotypical dumb jock but as the show has gone on, Finn's not dumb anymore, really, he's just a little naïve." Early reviews of Finn from television critics were mixed; Todd VanDerWerff of The A.V. Club said that he and Michele were "both agreeable and a little desperate for an outlet" in the pilot episode. Commenting on the fifth episode of the first season, Eric Goldman of IGN wrote, "We got to see a bit of a darker side to Finn [...] it's good to see this, because up until now, Finn's been a bit too strait-laced to totally invest in." In the second season's eighth episode, "Furt," Tim Stack of Entertainment Weekly noted "It's been a while since we've gotten some Finn focus, and I think I just missed Cory Monteith. But I also forgot what a good, natural actor he can be." 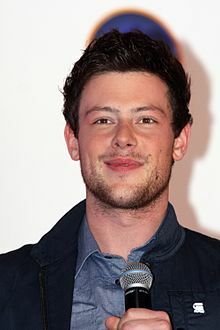 Monteith as Finn won the 2011 Teen Choice Award for Choice TV: Actor Comedy, the same category he had been nominated for in 2010. Although he was not a singer before being cast as Finn, Monteith sang lead or joint lead on a large number of songs on the show. In May 2010, the cast of Glee went on a two-week live tour with stops in Los Angeles, Phoenix, Chicago, and New York City. The cast performed hits from the show and several skits between songs. The following May, the cast went on a second tour with mostly new songs and all-new skits, performing for four weeks in the U.S. and Canada, and 11 days in England and Ireland. On July 20, 2013, Ryan Murphy stated in various media outlets that Monteith was set to have a tribute in the third episode of season five, which also dealt with the death of his character, Finn Hudson. Monteith began working with American actress Lea Michele in 2008, when they were cast as love interests on Glee. In early 2012, the media reported that they had begun dating. They remained together until his death a year and a half later. In December 2013, a few months after Monteith's death, Lea Michele stated that he was a very private person. Michele has released several songs about Monteith after his death. Her first song was "If You Say So," which she started a week after he died and is about the last words he said to her. In April 2017, Michele also released a new song called "Hey You," which is about Monteith and follows up from her song "If You Say So." On March 31, 2013, Monteith's publicist announced that Monteith had admitted himself into a treatment facility for substance addiction. He had previously received substance abuse treatment, when he was 19, following a history of drug use that began around the age of 12. According to Glee co-creator Ryan Murphy, Monteith's admission to rehab in March resulted from an emergency intervention on the Paramount lot, in which Murphy and other members of the Glee cast and crew urged Monteith to accompany doctors to the rehab facility, which had been arranged by the show. Monteith agreed, and was consequently written out of the final two episodes of Glee's fourth season, after being assured that he would still have his job upon his return. On April 26, 2013, it was reported that Monteith had completed his treatment. At the time of his death, Monteith was living in Los Angeles, where Glee was filmed. On Saturday, July 13, 2013, at the age of 31, Monteith was found dead in his room at the Fairmont Pacific Rim hotel in Vancouver. He was scheduled to check out that day following a seven-night stay, but when he failed to do so, hotel staff entered his room and discovered his body around noon. The Vancouver Police Department stated that the cause of death was not immediately apparent, but ruled out foul play. An autopsy was completed by the British Columbia Coroners Service on July 15. The preliminary autopsy report stated that Monteith died from "a mixed drug toxicity" consisting of heroin and alcohol, and that his death appeared to have been accidental. The final report, released by the British Columbia Coroners Service on October 2, 2013, confirmed these findings. It noted that Monteith also had codeine and morphine in his system at the time of his death, and that he was found with drug paraphernalia that included a spoon with drug residue and a used hypodermic needle, as well as two empty bottles of champagne. The coroner wrote that Monteith had experienced intermittent periods of drug abuse and abstinence throughout his life, and that "after a period of cessation from opioid drug use, a previously tolerated drug concentration level may become toxic and fatal." His stay in rehab only months before his death, and his attempt to stay off drugs, was responsible for his lowered tolerance to the drug. Monteith's body was cremated in Vancouver on July 17, following a private viewing by his immediate family and girlfriend, Lea Michele. On July 25, Michele and Glee creator Ryan Murphy held a celebration of life for Monteith in Los Angeles, attended by cast, crew, and creators of the show, as well as colleagues from the show's network and studio. After consultation with Michele, who also plays Monteith's love interest on Glee, showrunners postponed production of Glee's fifth season to August rather than late July. Consequently, the season premiered a week later than planned. The season's third episode, "The Quarterback," aired on October 10, 2013, and served as a tribute to Monteith, focusing on the death of his character Finn Hudson. The show then began a brief hiatus, which lasted until November 7, 2013, due to the extra time that was needed to decide how to proceed with the show following the death. After "The Quarterback" aired, Murphy noted that he had decided to "keep mentioning Finn...We don't just say this is done and we're never going to go back to it, so that resonates throughout the year." 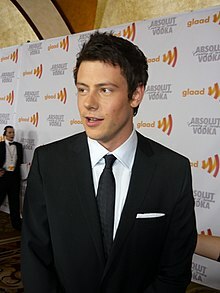 The 65th Primetime Emmy Awards, held on September 22, 2013, featured an extended tribute to Monteith by his Glee co-star Jane Lynch, along with four other actors who died in 2013. He was also featured in the "In Memoriam" segment of the 56th Grammy Awards. Shortly after his death, Glee fans raised money to "name a star" for Monteith, after being inspired by a scene featuring his character on Glee. Smallville Frat cowboy Episode: "Thirst"
Killer Instinct Windsurfer Bob Episode: "Forget Me Not"
Stargate SG-1 Young Cameron Mitchell Episode: "200"
^ Judd, Amy (July 14, 2013). "Notice of death of Monteith". Globalnews.ca. Retrieved July 21, 2013. ^ Gatehouse, Jonathon (November 15, 2010). "Profile of Joe Monteith". Maclean's. Retrieved July 21, 2013. ^ Tim Kenneally (July 14, 2013). "Obituary for Cory Monteith". The Baltimore Sun. Reuters. Archived from the original on July 14, 2013. Retrieved July 21, 2013. ^ Reid, Michael D. (August 14, 2009). "Aglow with Glee: Victoria's Corey Monteith can't fight the feeling". Times Colonist. p. D1. Archived from the original on July 19, 2013. Retrieved July 14, 2013. ^ a b c Walker, Jade (July 14, 2013). "Cory Monteith Dead: 'Glee' Star Dies In Vancouver Hotel Room". Huffington Post. Retrieved July 14, 2013. ^ a b c Malcolm, Shawna (June 26, 2011). "Cory Monteith's Turning Point". Parade. Retrieved June 26, 2016. ^ Malkin, Mark (June 23, 2011). "Glee's Cory Monteith Reveals Drug Past: 'I'm Lucky to Be Alive'". E!. Retrieved July 14, 2013. ^ a b Jory, Derek (May 16, 2011). "Cory Monteith: the Canadian Charger". Vancouver Canucks. Retrieved May 17, 2011. ^ a b Strachan, Alex (August 28, 2009). "Cory Monteith is gleeful about Glee". The Vancouver Sun. Archived from the original on January 14, 2010. Retrieved May 3, 2010. ^ Staff. "Cory Monteith Biography". People. Archived from the original on August 30, 2012. Retrieved June 10, 2012. ^ Staff. "Proud Oromocto father tunes in every week to watch his son Cory Monteith on hit show 'Glee'". Glee Club Live Journal. Archived from the original on July 19, 2013. Retrieved June 10, 2012. ^ "Anthony Meindl Actor's Workshop - Los Angeles Actors Testimonials". Retrieved 5 October 2014. ^ "Kaya Cory Monteith (as Gunnar)". MTV. Retrieved July 15, 2013. ^ Stransky, Tanner (April 9, 2010). "'Glee' star Cory Monteith, 'Melrose' actress Katie Cassidy join the 'Monte Carlo' teen dream team". Entertainment Weekly. Retrieved May 6, 2010. ^ Fleming, Mike (December 3, 2010). "Fox 2000 Buys Pitch For 'Glee' Guy Cory Monteith". Deadline Hollywood. Retrieved August 8, 2011. ^ "Monteith and Milligan go from cake shop to red carpet". CTV News. September 11, 2011. Retrieved September 12, 2011. ^ "Sisters&Brothers". Toronto International Film Festival. Archived from the original on September 10, 2011. Retrieved September 12, 2011. ^ "Cory Monteith had completed Canadian film". Toronto ON: Canadian Broadcasting Corporation. July 15, 2013. Retrieved July 17, 2013. ^ Cheung, Nadine (July 5, 2011). "Cory Monteith Says He's 'Straight But Not Narrow' in New PSA". cambio. AOL. Retrieved February 27, 2012. ^ "GLAAD Media Awards". GLAAD. Retrieved March 25, 2011. ^ "'Glee' Guys To Co-Host 2010 Teen Choice Awards With Katy Perry!". MTV. July 27, 2010. Retrieved May 12, 2011. ^ "'Glee' star Cory Monteith to host Gemini Awards". CTV News. October 18, 2010. Retrieved November 15, 2010. ^ a b c Gatehouse, Johnathon (November 15, 2010). "In conversation with Glee's Cory Monteith". Maclean's. Retrieved July 22, 2011. ^ a b Martin, Denise (April 26, 2009). "Video: 'Glee' team rewrites the school musical". Los Angeles Times. Retrieved May 19, 2009. ^ Malcom, Shawna (June 22, 2011). "Cory Monteith: 'I Don't Want My Dating Life to Be Tabloid Fodder'". Parade. Retrieved July 14, 2011. ^ VanDerWerff, Todd (May 19, 2009). "Pilot". The A.V. Club. Onion, Inc. Retrieved August 3, 2011. ^ Goldman, Eric (October 1, 2009). "'Glee: "The Rhodes Not Taken" Review". IGN. Retrieved December 7, 2009. ^ Stack, Tim (November 24, 2010). "'Glee' recap: Going to the Chapel". Entertainment Weekly. Retrieved August 7, 2011. ^ Nordyke, Kimberly (August 7, 2011). "Teen Choice Awards 2011 Winners Revealed". The Hollywood Reporter. Retrieved August 8, 2011. ^ "Past Performance Dates". Glee Live Official Website. Archived from the original on January 31, 2012. Retrieved December 17, 2010. ^ "Upcoming Performance". gleetour.com. Archived from the original on February 13, 2011. Retrieved February 11, 2011. ^ Kaufman, Gil (February 8, 2011). "'Glee' Tour Coming Back This Spring". MTV News. Retrieved February 8, 2011. ^ Dos Santos, Kristin (July 20, 2013). "Ryan Murphy Explains How Glee Will Return Without Cory Monteith: "Lea Michele Is the Strongest 26-Year-Old I Know"". E!. Retrieved July 20, 2012. ^ Waterman, Laura (December 2010). "O-M-Glee: Lea Michele and Cory Monteith". Teen Vogue. Retrieved July 25, 2013. ^ "Life & Style Exclusive: Glee Co-Stars Lea Michele and Cory Monteith Dating!". Life & Style. February 21, 2012. Archived from the original on September 27, 2013. Retrieved July 25, 2013. ^ Nudd, Tim (May 17, 2012). "Lea Michele & Cory Monteith Smooch at Hockey Game". People. Retrieved July 25, 2013. ^ Cory Monteith: 'Lea and I Are Dating'!. Los Angeles: The Ellen DeGeneres Show. December 6, 2012. Retrieved July 25, 2013. ^ Macatee, Rebecca (December 10, 2012). "Lea Michele's the "Luckiest Girl in the World" With Glee's Cory Monteith, Talks Kate Hudson Feud Rumor". E!. Retrieved March 31, 2013. ^ Freeth, Becky (July 25, 2013). "Lea Michele Gives Emotional Interview About Boyfriend Cory Monteith". Marie Claire UK. Archived from the original on July 27, 2013. Retrieved July 25, 2013. ^ Michele, Lea (December 11, 2013). "Lea Michele opens up about Cory Monteith on Ellen - December 2013". Retrieved April 9, 2017. ^ Michele, Lea (February 28, 2014). "Lea Michele Opens Up About Song "If You Say So"". Retrieved May 6, 2017. ^ Michele, Lea (May 3, 2017). "Lea Michele's new song "Hey You" Reads Like a Letter to Cory Monteith". People.com. Retrieved May 6, 2017. ^ Jordan, Julie (March 31, 2013). "Cory Monteith Checks into Rehab". People. Retrieved July 25, 2013. ^ Blumm, K.C. (July 15, 2013). "Cory Monteith's Long Battle with Substance Abuse". People. Retrieved July 25, 2013. ^ a b c d Rose, Lacey (July 20, 2013). "Cory Monteith Death: 'Glee' Co-Creator Ryan Murphy on Tragedy, Tribute". The Hollywood Reporter. Retrieved July 25, 2013. ^ "Cory Monteith completes rehab, Reunites with Lea Michele". People. April 26, 2013. Retrieved April 26, 2013. ^ "Cory Monteith Official Twitter". Twitter. Retrieved July 17, 2013. ^ "New Claims: Cory Monteith Was Living a Double Life". Extra. July 16, 2013. Retrieved July 17, 2013. ^ "'Glee' star Cory Monteith found dead in hotel in Canada". CNN. Retrieved July 14, 2013. ^ "Cory Monteith autopsy, toxicology completed". CBC News. July 15, 2013. Retrieved July 15, 2013. ^ "Glee star died from alcohol and heroin". BBC. July 17, 2013. Retrieved July 21, 2013. ^ BC Coroners Service (July 16, 2013). Cause of death confirmed for Cory Monteith. British Columbia: Province of BC. Retrieved July 16, 2013. ^ "Cory Monteith died of heroin and alcohol overdose: B.C. coroner". The Globe and Mail. July 16, 2013. Retrieved July 16, 2013. ^ Dhillon, Sunny (October 2, 2013). "Final report into Cory Monteith's death reveals details inside hotel room". The Globe and Mail. Retrieved October 2, 2013. ^ "Cory Monteith's Autopsy documentary reveals the Glee star tragically died because of his effort to break drug addiction". Mirror. Retrieved 15 August 2017. ^ "Monteith Cremated in Vancouver". People. July 17, 2013. ^ Goldberg, Lesley (July 25, 2013). "'Glee' Cast, Creators Remember Cory Monteith With 'Emotional Celebration'". The Hollywood Reporter. Retrieved July 25, 2013. ^ a b c Aguilera, Leanne (October 10, 2013). "Cory Monteith Tribute: Ryan Murphy Reveals What's Next for Glee, and Why Finn Won't Be Forgotten". E! Online. Retrieved October 11, 2013. ^ Weisman, Jon (September 18, 2013). "Emmys: Cory Monteith Tribute Discussed, Defended by Exec Producer Ken Ehrlich". Variety. Retrieved September 20, 2013. ^ "Glee Fans Name Star After Cory Monteith: A Touching Tribute — Exclusive". Wetpaint. Retrieved 5 October 2014. ^ "Killer Bash (2005)". Internet Movie Database. Retrieved July 16, 2013. ^ "Hybrid (2007)". Internet Movie Database. Retrieved July 16, 2013. ^ "The Invisible(2007)- Cast & Crew". Yahoo Movies. Retrieved July 16, 2013. ^ "Whisper- Cast & Crew". Yahoo Movies. Retrieved July 16, 2013. ^ "Teaching the Life of Music (2011)". Internet Movie Database. Retrieved December 19, 2016. ^ "Teaching the Life of Music (2011) (video commentary)". Noemi Weis, Filmblanc. Retrieved December 19, 2016. ^ Ebert, Roger (June 28, 2011). "Monte Carlo". rogerebert.com. Retrieved July 16, 2013. ^ "Sisters & Brothers:Synopsis". MSN. Retrieved July 16, 2013. ^ "All the Wrong Reasons". Shore Road Pictures. July 30, 2012. Archived from the original on June 6, 2013. Retrieved April 2, 2013. ^ Jeff Sneider. "Morse, Routh, Monteith to star in 'McCanick'". Variety. Retrieved April 2, 2013. ^ Armenakis, Eleni (June 20, 2013). "'MasterChef' gets downright 'Glee'-ful". Archived from the original on December 24, 2013. Retrieved July 15, 2013. ^ "16th Annual Screen Actors Guild Awards® Recipients". sagawards.org. January 23, 2010. Retrieved July 17, 2013. ^ a b c d e f g "Awards for Cory Monteith". Internet Movie Database. Retrieved July 15, 2013. ^ "2010 Hollywood Style Awards: Cory Monteith & Jayma Mays Talk". Access Hollywood. Archived from the original on April 7, 2013. Retrieved July 15, 2013. ^ DeNinno, Nadine (August 20, 2012). "Do Something Awards 2012: Winners And Best Dressed at VH1?s Annual Charitable Award Show". Ib Times. Retrieved July 15, 2013. Wikimedia Commons has media related to Cory Monteith.